We were excited to see if Panasonic could improve on last year's excellent Travel Zoom camera, the LUMIX DMC-TZ7, but alas the Panasonic LUMIX DMC-TZ8 falls short. The only improvements over its predecessor are a higher megapixel count and better placement of the shutter button. Apart from that it has the same lens and sensor size. The worst part is that its images are of poorer quality than the TZ7's, especially when using an ISO value above 200, and pictures look softer overall. Panasonic's LUMIX DMC-TZ8 is one of the most versatile compact digital cameras on the market: it has a 25mm wide angle lens with a 12x zoom, a 12.1-megapixel sensor and manual exposure controls. It also packs optical image stabilisation, comprehensive and accurate focus modes, as well as high-definition video recording. The problem is that its image quality isn’t great; in fact, it’s not an improvement over last year’s excellent Travel Zoom camera, the LUMIX DMC-TZ7. Both the Panasonic LUMIX DMC-TZ8 and the older LUMIX DMC-TZ7 have the same sensor size (1/2.33in) and focal range (25-300mm), but the DMC-TZ8 packs in 200,000 more pixels. The higher-resolution images aren’t as crisp-looking as the images taken by the TZ7 at 10-megapixels, and its mid-to-high ISO performance is of low quality, too. When shooting in low-light situations, the TZ8 will produce dirty images, especially if an ISO speed of 400 or higher is employed, but even at ISO 200, there is some discolouration in dark areas. The camera has an ISO limiter so that you can tell it what its maximum ISO speed should be when it’s in automatic mode — ISO 400 is the minimum value. Shots at ISO 400 will have noticeable loss of quality around edges and discoloured (purple) pixels in dark areas. This doesn’t bode well for indoor shooting, so you’ll be challenged when taking photos in a museum, for example. Top: ISO 200; middle: ISO 400; bottom: ISO 800. At full magnification, the discolouration and loss of quality is prominent, which will be a problem when cropping photos. However, even at lower magnification levels, such as when viewing photos on a high-definition monitor or TV, the imperfections at ISO 400 will be noticeable. When shooting in bright sunlight, with a low ISO and a mid-range aperture, the Panasonic LUMIX TZ8 can take photos at a decent quality, and its ‘Intelligent multiple metering’ mode is good enough to properly expose contrasting colours in bright light. But the problem is that its images are not an improvement over the Panasonic LUMIX DMC-TZ7, so if you’ve currently got a TZ7 you shouldn’t feel as though you’re well behind in the technology stakes. In fact, in our opinion, you have the better camera. Along with the noticeable noise and colour problems above ISO 200, images are soft when using the smallest aperture value — which, at f/6.3, isn't as small as we would like. At this aperture setting, the picture quality will suffer from a slight degradation in detail and images will look a little blurred. It’s something we noticed when shooting in both aperture priority and landscape modes (Panasonic calls it Scenery mode) on a sunny day; the landscape photos looked much sharper than the ones taken in aperture priority mode. The camera selected a larger aperture of f/5.3 when it was in landscape mode, and this resulted in much sharper images. 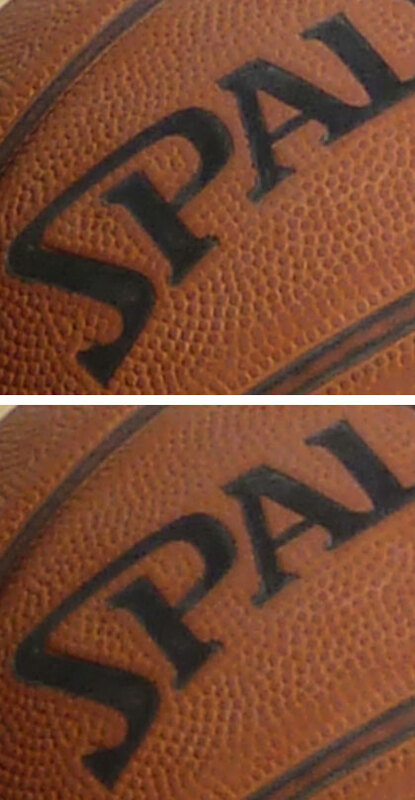 Using aperture priority mode, we shot this basketball using an aperture of f/4.0 (top) and f/6.3 (bottom). If you look at the dimples and the edges of the letters (‘A’ in particular), you can see that there is a noticeable drop in detail at f/6.3. Furthermore, the image just looks softer overall. The poor ISO performance above ISO 200 and the soft images at the smallest aperture make the manual features of the LUMIX DMC-TZ8 limited in their usefulness. This is a shame because Panasonic has introduced a dedicated ‘Exposure’ button that allows you to easily change the aperture size and shutter speed on the fly (as long as you remember not to press the Set button after every change, as this will take you to the main menu instead). There is a ‘Q.Menu’ button that brings up many regularly used settings such as white balance, drive mode, focus type, ISO speed, picture size, intelligent exposure mode, and image stabilisation mode. We appreciate Panasonic’s decision to swap the positions of the shutter button and mode dial, but we lament the decision to remove the dedicated video recording button in favour of an ‘E.Zoom’ button. 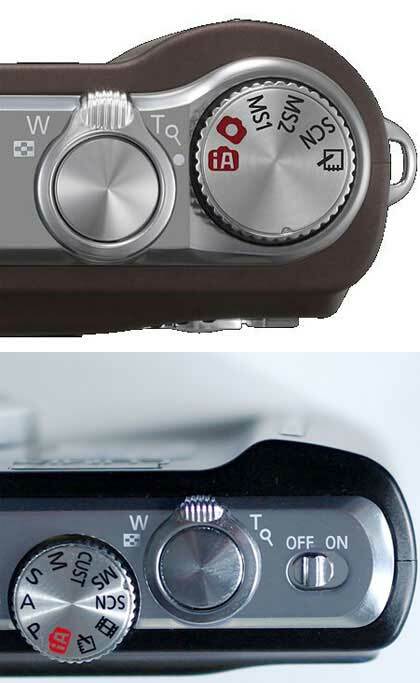 We didn’t like having to reach over the mode dial to get to the shutter button on the DMC-TZ7 (top). The TZ8 has a more comfortable design. The inclusion of the ‘E.Zoom’ button at the cost of the dedicated video recording button means that you have to change the mode dial to video mode before you can start shooting motion pictures. This is annoying as the ‘E.Zoom’ button isn’t useful; its function is to takes the lens all they way up to its maximum 12x zoom point, and then back to its 1x point when it’s pressed again. It’s the same exact function as the zoom lever around the shutter button. The DMC-TZ8 can shoot video in high definition (1280x720) and this makes it a useful hybrid for travellers who don’t want to take a bulky camcorder with them — but it would be even more useful with a dedicated video record button. The focusing performance of the LUMIX DMC-TZ8 is fast and versatile (you can choose from single or multi-point focus, as well as face or motion tracking modes) and it can capably autofocus in video mode, too. You could definitely say that we’re disappointed with the Panasonic LUMIX DMC-TZ8. Despite being released a year later than the LUMIX DMC-TZ7, it’s not a better camera. It can take some decent looking images in bright light when using its auto mode, but overall its images are noisier and softer than the TZ7 and it won’t perform optimally indoors or in other low-light environments.